Wahama junior Grace Haddox relays a throw back to the infield during an April 12 non-conference softball contest against Buffalo in Hartford, W.Va.
WATERFORD, Ohio — In dodging two bullets, the third one finally caught up with the Lady Falcons. 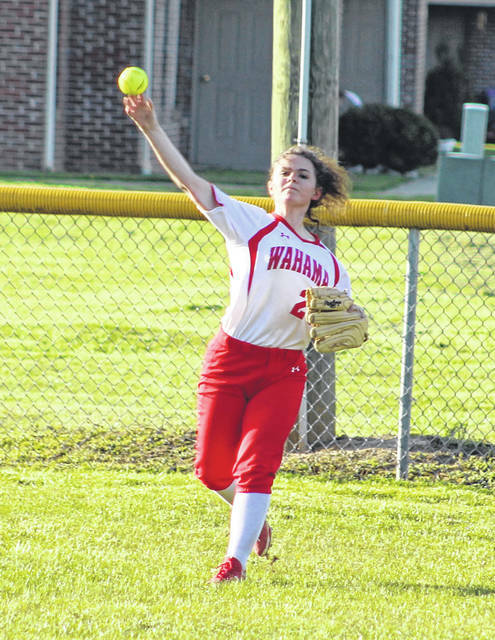 The Wahama softball team committed an error with two outs and the bases loaded in the bottom of the seventh, allowing host Waterford to claim a 10-9 victory on Thursday night during a Tri-Valley Conference Hocking Division contest in Washington County. The visiting Lady Falcons (12-10, 8-3 TVC Hocking) were down 6-3 after an inning and rallied for an 8-6 advantage midway through the third before finding themselves deadlocked at nine through five frames with the Lady Wildcats. After a scoreless sixth and a scoreless top of the seventh, the Green and White started the home half of the seventh with three consecutive singles that led to a bases-loaded situation with nobody out. Wahama managed to induce consecutive ground balls that resulted in a pair of force outs at home, which still left the bases full with Waterford’s eight-hole hitter headed to the plate. Smith bounced an 0-1 offering towards the gap between second and third, but the ball squirted through a drawn in infield as Huffman came in with the winning run — allowing Waterford to secure a 10-9 triumph. The victory also allowed the Lady Cats to avenge an 8-4 setback back on April 10 in Hartford, W.Va. The Lady Falcons took an early lead in the first after Hannah Rose scored on a fielder’s choice by Maddy VanMatre, who joined Ashtyn Russell in scoring later on after a two-out double by Victoria VanMatre gave the guests a 3-0 advantage. Waterford responded by sending nine batters to the plate in the home half of the first, which led to six runs on four hits, a walk and an error. Smith’s two-run homer with two away capped the frame as the Lady Cats led 6-3. Emily VanMatre tied the game in the top of the second with a three-run homer to centerfield, then Rose gave Wahama its first lead in the third with an RBI-double that plated Grace Haddox. Rose later scored on an Emily VanMatre single for an 8-6 edge midway through the third frame. Two hits, a walk and a wild pitch resulted in a tie game three batters into the bottom of the fourth, then Taylor came home on a two-out single by Young that gave Waterford a 9-8 lead after four full frames. The Lady Falcons tied the game at nine in the fifth after a two-out error allowed Emily VanMatre to reach safely as Haddox scored from third. Both teams had a dozen hits and committed three errors apiece in the contest. Wahama stranded nine runners on base, while the hosts left only two on the bags. Baldwin was the winning pitcher of record after allowing one unearned run and four hits over four innings of relief while striking out one. Hannah Billups took the loss after surrendering six earned runs, 12 hits and two walks over 6⅔ frames while fanning two. Rose, Haddox and Victoria VanMatre led the Lady Falcons with three hits apiece, followed by Emily VanMatre with two hits and Emma Gibbs with one safety. Emily VanMatre led the guests with four RBIs, while Rose and Haddox each scored three runs in the setback. Offenburger paced Waterford with three hits, with Taylor, Neader, Young and Smith each contributing two hits apiece. Wahama was at Federal Hocking on Friday and is scheduled for a non-conference doubleheader on Saturday at Roane County.